flow from one part to the next altering the way the eye perceives the form of the finished piece. Joints are clean. Finished surfaces are smooth and irresistibly soft to the touch. This work takes a careful eye. It is the work of a perfectionist. This is Jason’s speciality. How did you come to woodworking? I was a construction worker and wanted to change trades. What is your speciality or skill? What process are you working on in the image above? What machine or tool does the process require? What is the length of time required to complete the process? 20 minutes for the entire crib. Can you share some details about the process? What makes it particularly difficult or unique requirements of the process? Parts need to be machined properly so everything fits well. It takes the entire team of workers to create a great product. Working with the imperfections of wood. What do you enjoy most about the trade? Creating a beautiful product for customers. 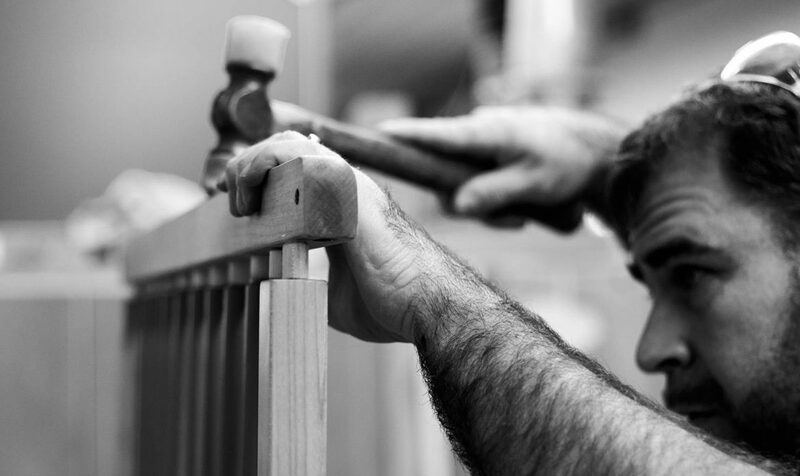 What brings you the most satisfaction in woodworking? Seeing all the pieces necessary for a finished product come together to make a beautiful piece.